Robert Mugabe has vowed to press on with his policy of forcing all companies to cede economic control to black Zimbabweans. "Indigenisation" was one of his main campaign issues for last month's election, which he officially won. Mr Mugabe, 89, denies opposition claims that the voting was rigged in his favour. He says black Zimbabweans need help as they faced discrimination during white minority rule, which ended in 1980. His policy of seizing most of Zimbabwe's white-owned farms is widely seen as having caused the country's economic collapse from 2000-2009. Mr Mugabe says giving black Zimbabweans control of the business sector is the next step and said the election result had given him a "resounding mandate" to do so. "We will do everything in our power to ensure our objective of total indigenisation, empowerment, development and employment is realised," he told a public rally to mark the annual Defence Forces Day. He said the policy was the "final phase of the liberation struggle" and "final phase of total independence". Foreign-owned companies are already supposed to ensure they are at least 51% locally owned - a policy which some analysts say has scared off potential investment from abroad. Reuters news agency reports that the local operations of foreign-owned mining companies have already been targeted, while banks could be next. 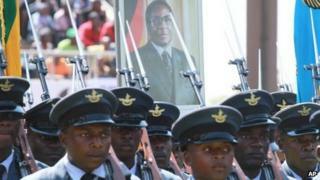 The opposition Movement for Democratic Change (MDC), which says Mr Mugabe stole the election, boycotted the rally to mark Defence Forces Day and has attacked the indigenisation drive. On Monday, Mr Mugabe said that his critics could "go hang", in his first public speech since the disputed election. Zimbabwe's economic meltdown halted in 2009 after a power-sharing government was established and the local currency abandoned. Some of Mr Mugabe's allies have suggested that the Zimbabwe dollar could now be re-introduced but they have stressed this would not happen soon. His critics say much of the land seized from white farmers was either given to his cronies or to people who lacked the expertise or resources to use it productively. He retorts that Western powers are sabotaging Zimbabwe's economy because of his anti-colonial stance. The Constitutional Court is to start considering the opposition's legal challenge on Wednesday, following a two-day public holiday. The nine-member panel of judges has two weeks to either endorse Mr Mugabe's re-election or order a rerun. Mr Mugabe won 61% of the vote in the election on 31 July, with his long-time rival Morgan Tsvangirai of the MDC on 35%. The president's Zanu-PF party also gained a parliamentary majority of more than two-thirds, winning 160 of the 210 seats.